This indoor water garden is sure to get conversation started. Its fuzzy rosette leaves float above the surface, while its dark, feathery roots float below. It is part flower arrangement and part houseplant—a delightful mix that won’t fade into the background. 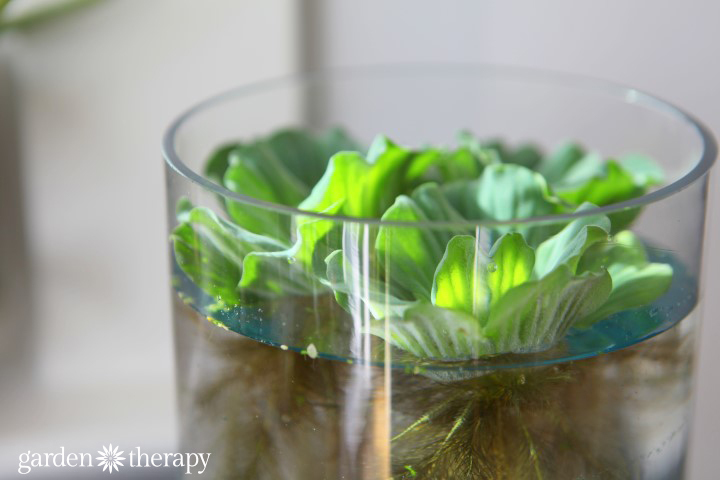 An indoor water garden adds a touch of whimsy and a peek-a-boo view below the surface. 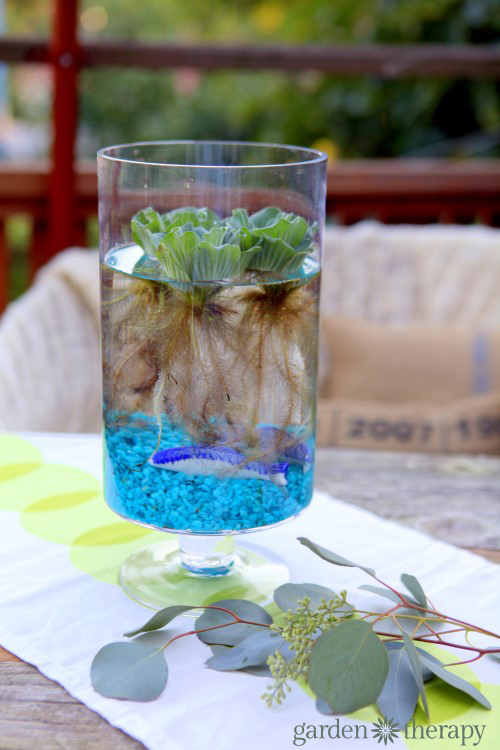 Follow along with these instructions to make an easy tabletop indoor water garden in a vase, with a few friends thrown in for company! See more creative indoor plant projects here, here, and you won’t believe this one here! There are a number of water plants that don’t require soil to grow. They are called “floaters” (for obvious reasons). Some floating plants, such as frogbit (Limnobium spongia), look like large clusters of tiny leaves that cover the surface of the water. 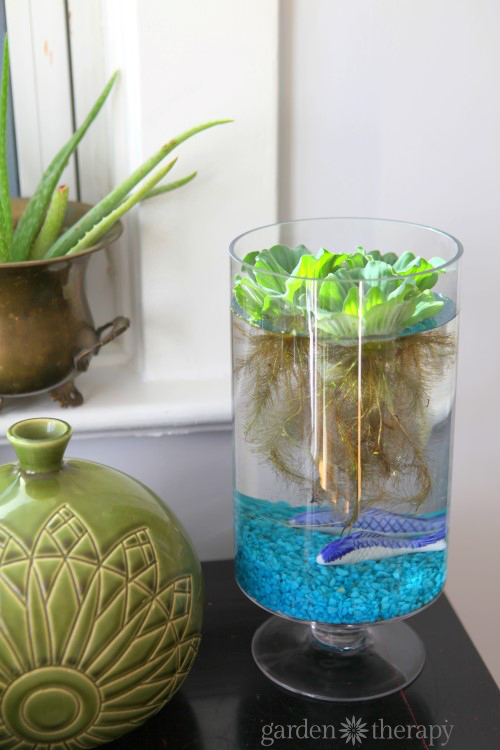 In a glass water garden like this one, I prefer to use large floaters with long, graceful roots such as water lettuce (Pistia stratiote) or water hyacinth (Eichhornia crassipes). Start with a tall, cylindrical vase for this project. 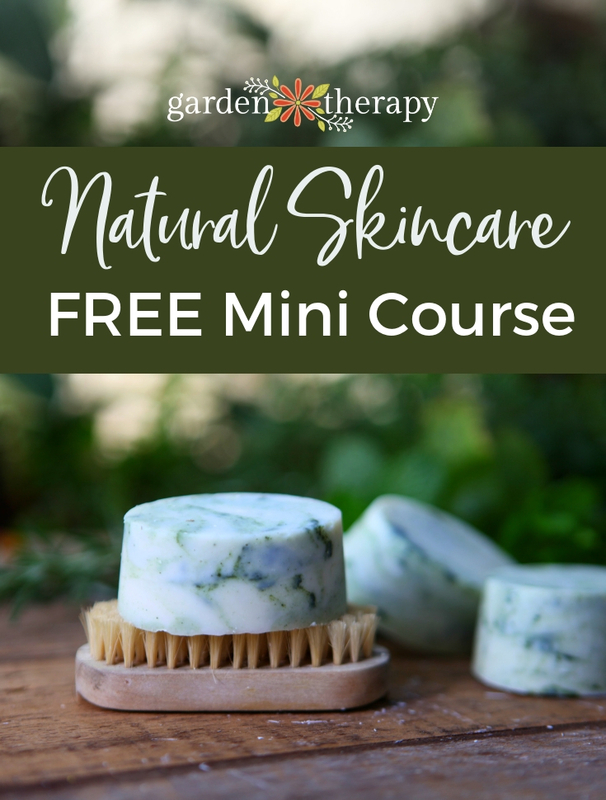 Wash it with soap and water, rinse well, and dry it to ensure that there are no unseen bacteria or fungus that can grow and taint your water garden. 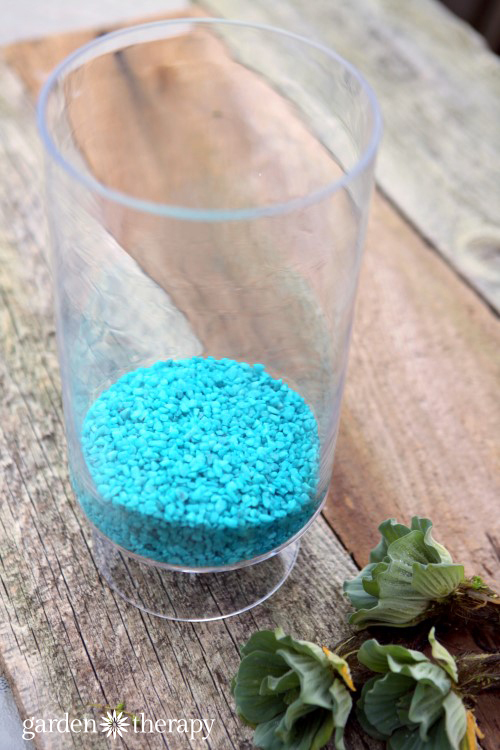 Add a layer of colored pebbles on the bottom of the vase. I chose a bright color, but you can choose any type of rocks or pebbles that suit your space. 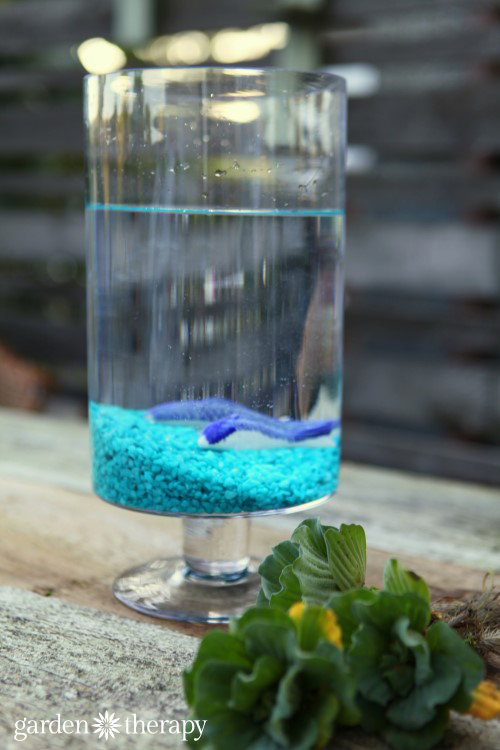 Fill the vase with water and let stand for 24 hours to allow the chlorine in the water to evaporate. The chlorine may cause the leaves of the plants to yellow, so it’s best to let it stay out overnight. Alternatively, use collected rainwater for your garden and you can plant it right away! 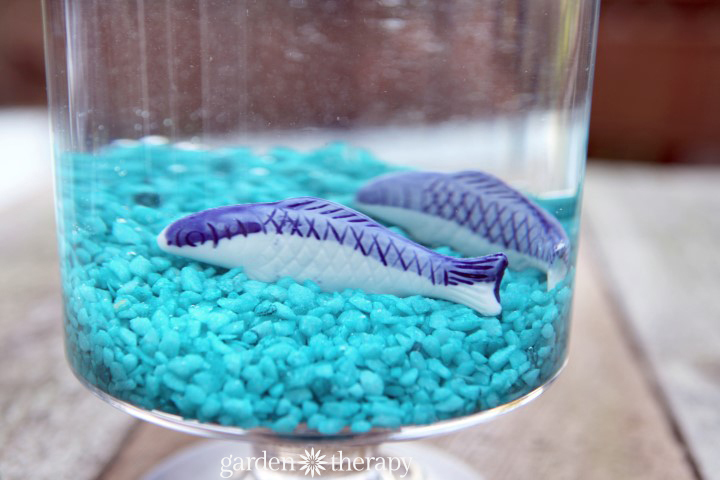 You can add a couple of ceramic fish to the bottom of the vase but I caution you against adding real fish.While I have seen projects with goldfish or bettas, a vase is too small and the plants at the top actually limit the oxygen available to the fish. 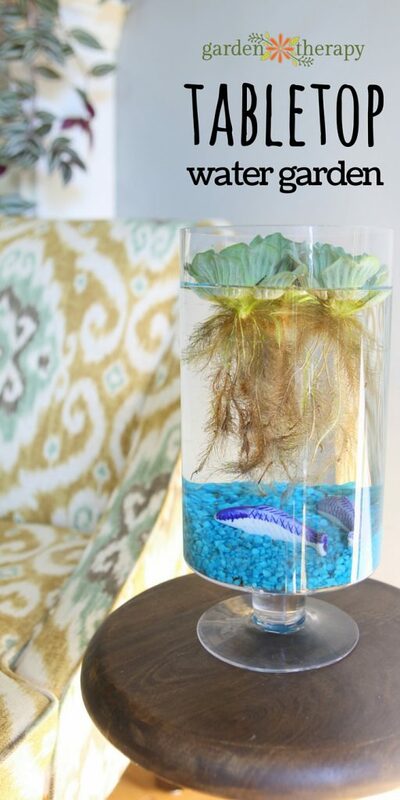 Read more about the safety of betta fish in plant vases here. An indoor water garden like this doesn’t require much care. I mean, you certainly don’t have to water it! Well, you may have to top off the water now and then, and change the water if it becomes murky, but overall this indoor water garden is virtually maintenance-free. Pond plants are meant to be kept in an outdoor environment. In my experience they last quite a long time in an indoor garden, but eventually they will need to be replaced. 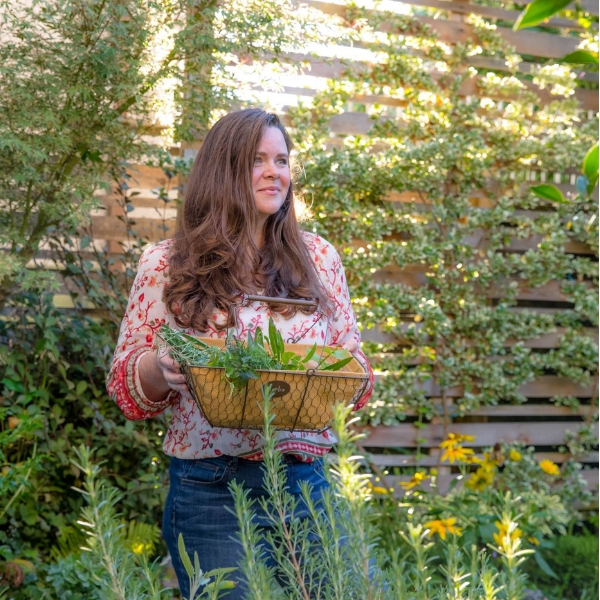 However, if your practiced green thumb allows the plants to thrive so much that they multiply, you can move them to your outside pond or even make up another indoor water garden to give away as a gift. 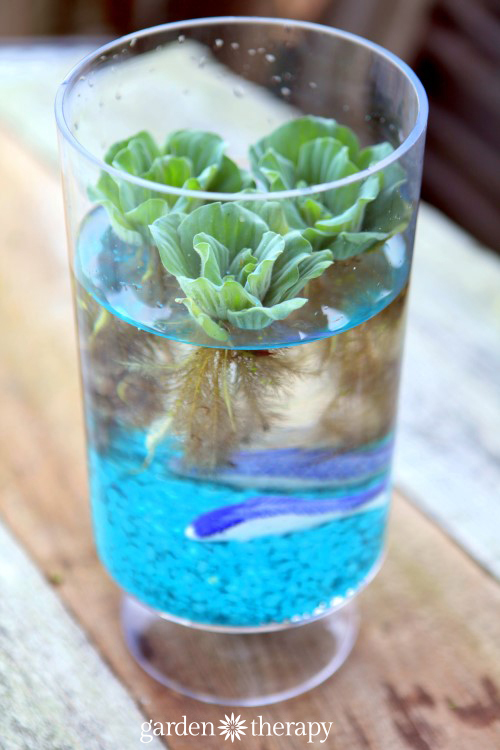 Such a great idea, I need to make one of these and try adding a live fish. Just to get me thru th upcoming winter months! If you have time please add this and two other of your favorite blog posts to our link party. It just went live sunday afternoon and I think our followers would love it! Awesome idea and looks so pretty. :) Where did you purchase the plant from? Can you recommend any other plants for a tabletop water garden? I would love to know where you got these cute little water lettuce? I have been searching and they are either flat like frogbit or giant and wouldn’t fit in the container I have. At my local garden center. I’ve seen them at pond supply stores as well. They are about 4″ in diameter. Just make sure to check with your state DNR, as both water hyacinth and lettuce are “outlawed” in many states, as the roots of the plants clog the waterways. Not sure about frigbit. Don’t just toss them in a body of water when you’re done with them, rather put them in the garbage where they won’t end up in waterways. They can/will become invasive otherwise.